The Instant Hausfrau | just add Baby. An Open Letter to My Daughter, age 5 1/4. Someday, you will discover the amazing foods that are there for the trying in this world. You will try curries and soups, vegetables and fruits and spices, roasted and steamed and baked and raw delicacies; there are so many wonders of taste to explore! That day is obviously not today. Someday, your family will sit down to have dinner, and we will laugh and enjoy each others’ company while we eat. You will not burst into tears at the thought of having to try a bite of something new. Because of this, The Husband will not scream and rail at you before leaving the table in black cloud of fury. That day is obviously not today. Someday, your “picky eating” will be a distant phase that we laugh about. You will be agog at all the things you didn’t try, and wonder whatever stopped you. That day is obviously not today. Today, I poured my heart and soul into our dinner. I started my preparation for this meal days ago, when I began reading you books extolling the virtues of Southern cuisine. Ah, the tastes of my youth. I made the banana pudding with layers of vanilla wafers, just like the picture you exclaimed over in your picture book. You were so excited to see the pudding when you came home from preschool! You helped make everything else on the table, and couldn’t wait for the fresh biscuits to be done. I did not expect you to embrace your bite of collard greens with any enthusiasm; I was shocked, however, when the concept of fried chicken had you weeping and wailing in your seat. Tears in your eyes, you cried out that you needed your mama’s lap to try a bite of the food you had only an hour earlier so gleefully helped prepare. You hated fried chicken, child. At least you saved the spit-take for the collard greens. I am agog that you didn’t even like sweet tea, and am forced to question whether we share any genetic material whatsoever. I was a picky eater once, and I remember those same feelings you are experiencing now (the fear, the revulsion at some of those textures in your mouth). In some ways, this makes it worse as I know now how wrong I was to turn away from so many wonderful foods. Someday, you will figure out that you cannot subsist on a strictly carbohydrate diet. Your body needs things to eat besides biscuits, rice, oatmeal, popcorn, crackers, toast, and tortillas. That day is obviously not today. …but could it please be tomorrow? Day 4 | Christmas Ships. A 60-year Seattle tradition, the Christmas Ships make their way around Puget Sound during the month of December. Decorated in lights, the parade of Argosy ships and local boat owners stops at various beaches and parks around Seattle. On board the Christmas Ship is one of many local choirs (different choirs on different nights), and a 20 minute performance occurs at each stop. You can buy tickets to travel on board the Christmas Ship or one of Argosy’s Parade Ships that follows, or gather on shore to greet the ships as they arrive. We caught the Christmas Ships on their stop at MOHAI, where the museum hosted a lovely party complete with Santa, cocoa, the Dickens Carolers, decorate your own sugar cookies, and flashlights for the kids as we made our way to the waterfront. And did I mention it was all free? I don’t know if MOHAI will be hosting the Christmas Ships after 520s expansion forces their move to South Lake Union, but their wonderful holiday gathering should be on your list if they do. You can still catch the Christmas Ships at any number of gatherings this year. A full schedule and list of participating choirs (as well as ticket sales for those wanting a voyage) can be found at the Argosy site here. 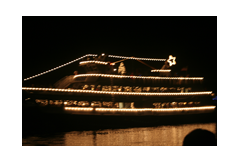 Argosy Christmas Ships | $25 – $99 / adult, $10 – $39 / kid, free to enjoy from shore. Day 3 | Seasonal Sweets The usual holiday baking from scratch is completely out the window for us here. The twins have just turned three months old, and are in full growth-spurt swing, leaving very small pockets of time to get anything done between feeding them. And feeding them again. And again. How in the world are you hungry again? 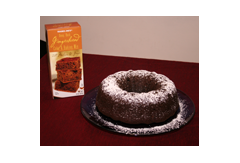 Trader Joe‘s to the rescue, with their Gingerbread Cake and Baking Mix. Simple, delicious, and something I could do with the Big Sister while her brothers were (all too briefly) napping. 2 boxes were needed to fill a bundt pan, and the bake time then became 55 minutes or so at 350 F. Moon loves helping cook, and the reminder that babies don’t get to eat cake doesn’t hurt either when the twins are commanding so much time and attention. If the thought of even a baking mix seems like too much, Trader Joe’s has France’s favorite holiday treat in their freezer case — Buche de Noël (Yule Log). Thin slices of chocolate cake, surrounded by chocolate mouse, covered in a thin layer of chocolate and made to look like a log. Dusted with powdered sugar snow and meringue mushrooms, it is a sugar-filled seasonal treat you won’t want to miss. And of course, those wanting something local and more portable shouldn’t miss the holiday cupcakes at Cupcake Royale. Flavors like Egg Nog, Candycane, and even a Figgy Pudding cupcake with brandied chocolate buttercream (!) beg to be tried. Check out the Cupcake Royale blog for all the delicious details. Can’t get enough sweets? 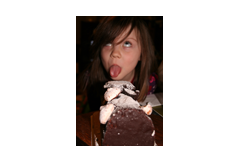 Be sure to check out Cakespy, where there is always something new and delicious to tempt you with. Wow, second day and I’m already behind. As I scramble to catch up, here’s what should have been Yesterday’s post: Day 2 | Simple gifts. For today, a small selection of gift ideas that might work for someone in your life. As always, these recommendations are purely based on my own (or my family’s) experience of the products involved, and none are paid endorsements. I do not do sponsored or paid posts. It’s kind of sad that I have to say that, but there you are. Weaving Sticks | These are a small bit of awesome that Moon received as a gift from my mother-in-law (who is, by profession, a weaver herself). While knitting and sewing are a bit on the complex side for Moon’s basic coordination and patience levels, she can make her own scarf with these, and it’s way cooler than a potholder loom. The number of sticks used will determine the width of the creation, and how long your child is willing to keep going determines the length. There is no accounting for the tastes of the child involved, and some of Moon’s color combinations are a bit… exciting. That said, she loves making small beds for her animals and other toys, and once the sticks are set up, she can complete the task on her own. 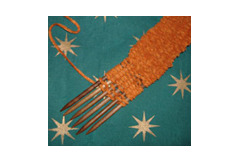 Full weaving stick instructions online here, and at $4.99 plus shipping from Pine Box Traders here, you can’t beat the price. Pick out some fun colors of yarn to round out the gift, and your crafty-parent friends will thank you when their child is too busy with her or her own project to ‘help’ with the parental ones. Customized Caffeine | Any new parent is going to be missing one thing in their life: sleep. While that sweet, sweet slumber isn’t giftable, you can send them a relative equivalent with a Starbucks Gift Card. Yes, it’s corporate coffee, but the Starbucks advantage is that no matter where your new-parent friends are living, there is bound to be one nearby. And with their customizable gift cards, you can create a really personal gift that still allows a bit of freedom of choice for your friends. They choose their caffeinated beverage, you get to to have fun designing the card. While all card designs are subject to review for some reason, they printed “CAFFEINE IN LIEU OF SLEEP” across the top of my recent order for friends with newborn twins, so I am pleased as punch with the results. Customized Starbucks Card | $4.00 for Customization & shipping, + however much you want on the card. They Might Be Giants Here Comes Science | Everyone (and I do mean everyone) in my husband’s family who is not a weaver or my husband is a scientist it seems, and they run the gamut from cello players to mandolin to base guitarists, so I feel totally justified in creating this category of kid. Moon got this CD/DVD combo for her birthday, and we’ve been loving it ever since. The concepts are naturally more advanced than those in the prior “Here Comes” releases, but just as catchy (everyone in our family is singing the shooting star round). I love that she’s being introduced to concepts like velocity and friction in a completely non-threatening way, even if it seems as though the last thing this family needs is another scientist. Those looking for something more basic can enjoy the ABC’s and 123’s as well. 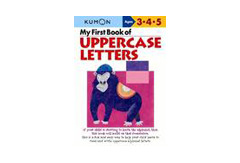 Kumon My First Book of Uppercase Letters | The Kumon books started for our family as a plane trip purchase — the tracing and mazes seemed like good entertainment while trapped on an airplane, and proved popular enough that we keep coming back. This book built an excellent foundation for Moon with writing, which means she now carries around small notebooks to scribble in on a regular basis (most recently, sounding out the lyrics on some They Might Be Giants songs so she could write them down). They have the Japanese obsession with stroke order when writing, but continue to be helpful and maintain Moon’s interest. This is also something that is easy to do ‘with her’ while trying to tandem nurse her twin brothers. So if you have travel or a sibling on the way, a workbook like this and a pack of crayons is an excellent investment. Finally, lots of fantastic ideas, as always, on the Cool Mom Picks Holiday Gift Guide, to whom I owe a debt of gratitude. They always have great suggestions, but I am most grateful for their writing style, which I have co-opted their for this post. Happy gift-hunting! We’ve survived our Thanksgiving tryptophan coma, and suddenly it’s December 1st. Time for the countdown to Christmas to begin in earnest, which means time for the annual Activity Advent Calendar around here. Those looking for a lovely and simple paper advent calendar can check out the Eeboo calendars at Buggy in Madrona (I love the Woodland design pictured here). There is a small variety of lovely animal scenes to choose from, with nary a licensed character in sight. Lots of options when it comes to advent calendars filled with chocolate, just none from locally owned or crafted sources. Those willing to let their children sugar up daily in anticipation of the holiday can find Chocolate-filled advent calendars at Ikea, Trader Joes, and World Market (to name a few). While you won’t generally find licensed characters here either, you also won’t find calendars known particularly for their artistic merits. Feeling guilty about the waste of resources involved in more traditional advent calendars? While a bit too late for this year, Etsy seller thymbyldesigns has a beautiful Matryoshka Advent Calendar, just waiting to be filled with chocolates, toys, or even holiday crafts and ideas to complete each day (pictured at left). For the past couple of years, we have been reusing this calendar from Starbucks, refilling it with a variety of small items and ideas each year. Unfortunately, Starbucks seems to have gotten out of the Advent Calendar business. But why run from licensed characters, when you can embrace them? Starwars.com’s Bonnie Burton offers a make-your-own Advent Calendar idea that is strong in the Force. Simple, economical, and as creative as you want to make it. I fully approve. (You could of course make your calendar without the StarWars characters, but where’s the fun in that?). The final frontier in Advent Calendars, those with a punk bent will enjoy the Punk Rock Advent Calendar from Plastic Punk Records. Enjoy a new MP3 file each day, free. Wonder where Oi! To The World is hiding? The twins will make it more of a challenge (They’ll be 3 months old tomorrow! How did that happen? ), but I’ll be trying to offer a different holiday craft/activity/or idea each day in December as part of my own advent calendar here on Instant Hausfrau. It’s something I have attempted other years, and enjoyed the attempts. Hope you do too. Blue C Sushi makes a national list of 14 best restaurants for kids — pirates and ninjas also well represented. Posted on the P.I. website, with photos from the recent show in downtown Seattle. Just amazing to see. Older Sigg bottles contain BPA — yuck! And yet another reason to shop Buggy, which stocks the BPA free Kleen Kanteens (I swear, I am not on Buggy’s payroll). Feeling Crafty? One week free trial at the Commercial Pattern Archive started on the 19th, and ends the 25th. Login with username: guest and the password: pattern, then look forward to printing any of the amazing vintage patterns they have scanned. Ponyo is getting good reviews — 92% on Rotten Tomatoes — and with it’s G rating promises to be excellant family entertainment from Totoro‘s creator. Seattle Showtimes here. Quick disclaimer note: if I am recommending products/services/what have you, I’m not being in any way paid to do it. I just think they are neat/good/worth supporting. The Cool Mom Picks Back To School Guide is out, and as always full of great things you wish came in grown-up sizes. While the pricing is sometimes scary to me, the folks at CMP are always good about getting discount codes where they can. Of local note: Included in this year’s recommendations are See Kai Run‘s shoes (yay Seattle company! ), as well as the Fall collection from Livie and Luca, which can be found at the wonderful Buggy in Madrona (and hey! I notice Buggy now offers online shopping too! No Fall shoes online yet, though). The German tradition of Schultüte, giant paper cones filled with school supplies and gifts for the first day, is a charming one that more and more people seem to be adopting. Alpha Mom has instructions for making one here, should your child be so lucky. Google image search really shows a great variety, should you be looking for decorative inspiration. Martha Stewart offers a selection of back to school crafts on her website, mostly involving printable PDF files you customize for your family’s needs. Get inspired on the lunch-making front by checking out the elaborate Japanese-style box lunches at the Bento Challenge livejournal community. While my daughter will still ignore carrots, even if cut into pretty flower shapes, I love looking at what other folks are doing. I’ve also really enjoyed the sample school lunches from around the globe posted on Vegan Lunchbox. I’ve mentioned them before, but in these uncertain times it’s more important than ever to go back to school with Project Cool, a non-profit organization that gives backpacks full of school supplies to children in Seattle/King County homeless shelters. These are kids without homes, often families who are fleeing Domestic Violence, who otherwise don’t have supplies to get them through the school year. This program does amazingly important work, and it makes a real difference in the lives of so many kids. (I’ll update this post to add more specific donation information for this year’s Project Cool as soon as I hear back from their offices). # Underfeed your child so he or she will become skinny and awkward. The child will then pursue academia instead of sports and social channels. First day of School for Seattle Public Schools is September 9th, 2009; a mere 3 weeks away. Where did the Summer go? Full Tilt Columbia City, whose sign read, “Closed due to melting”. I weep. Best discovery? Light Rail Trains are air conditioned.